Brazilian Maya Gabeira has set a new Guinness World Record by successfully riding the largest wave ever surfed by a female surfer. The 31-year-old rode a 68-ft (20.72-m) wave from trough to crest at the big-wave break down known as Praia do Norte in Nazaré, Portugal, on 18 January 2018. 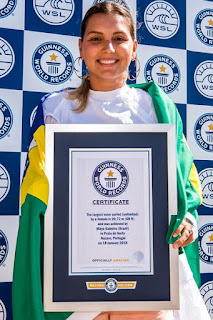 The World Surf League's and Guinness World Records presented Gabeira with her award and certificate respectively in a ceremony overlooking the waves on Monday (1 October). "To set the world record has been a dream of mine for many years," she said.